Sing to Life: Granny Bread - Printable recipe at bottom. It's early in the morning. The dishwasher is running, I've watered the garden, and the dining room chairs are up so that I can mop. I'm feeling home-y today, and in celebration of this home-y feeling - and the fact that it is Friday - I am posting one of my favorite recipes. This is what Brian calls "Grainy Bread," but the first time I heard him call it that, I thought he said "Granny Bread." And that's what I've been calling it ever since. It just reminds me of something my grandma would make - lots of fiber and straight-up delicious. I make this in my KitchenAid. 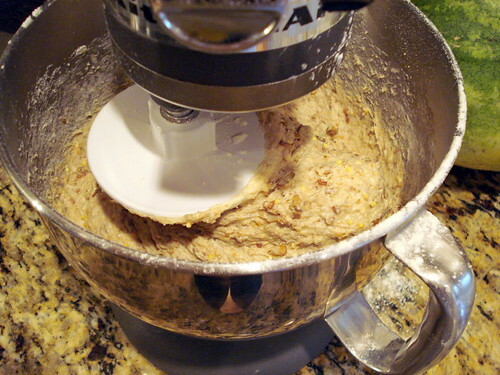 If you don't have a KitchenAid, you can use beaters - until the dough gets too thick - and then knead by hand. But that is not fun. 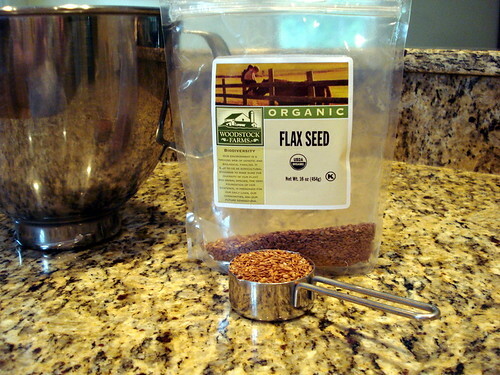 Dump in 1/4 cup of flax seed. Or more. Or less. It's up to you. I bought this at Food Lion in their "natural foods" section. 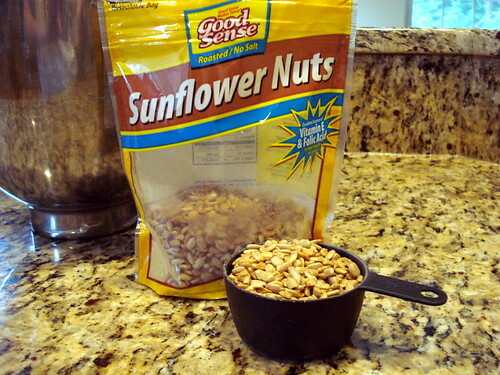 Next, 1/2 cup of sunflower seeds. 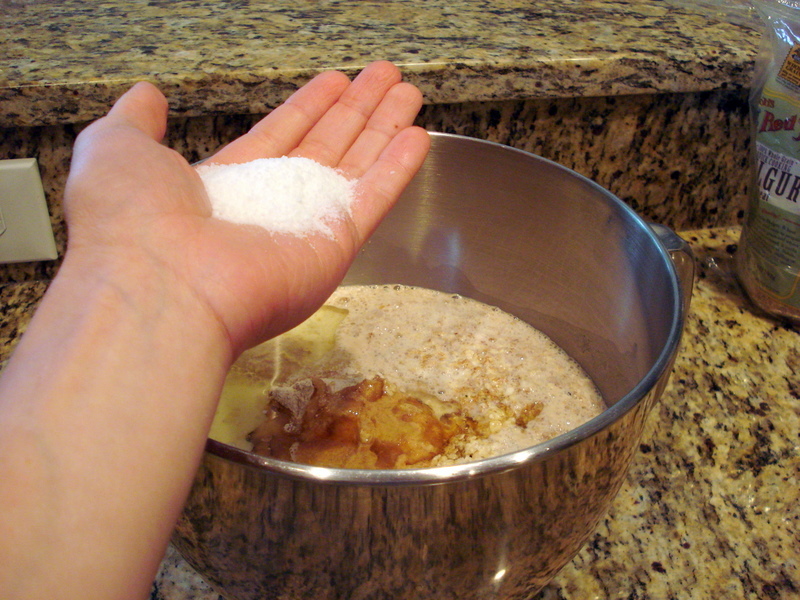 I make sure to use unsalted, because then it's easier to control the salt amount in the recipe. I bought these at Walmart. 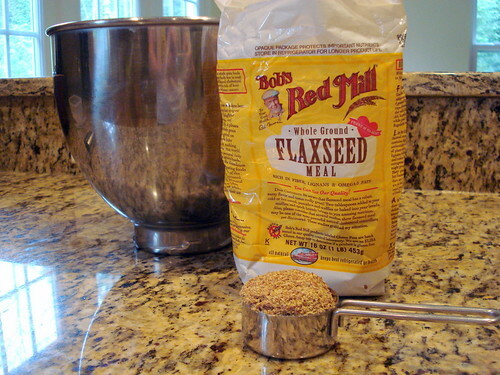 Here's 1/4 cup flaxseed meal. Don't ask me why it's important. I just thought it looked healthy and I bought it when I was at Food Lion. My sweet mother sent me some millet one day when I told her I couldn't find any in stores near me. It adds a crumbly crunch to the bread. Whatever that means. Let's add 1/4 cup, shall we? 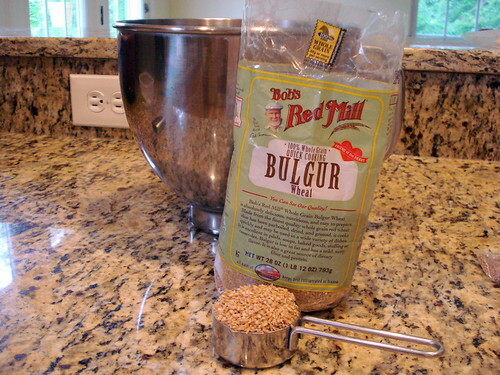 Here, I'm adding 1/4 cup bulgur. Usually, you're supposed to cook this like barley or something, but I think it tastes really good, raw, in this kind of bread. It gives it a hard, nutty crunch. And it gets stuck in your molars so you can keep getting tiny bites of your bread as the day goes by! I hope this isn't already getting old. 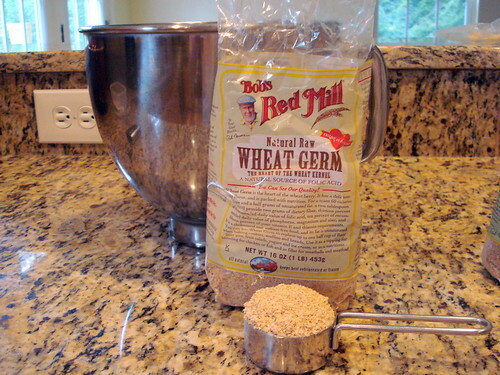 Next up, we've got 1/4 cup of wheat germ and 1/2 cup of wheat bran! 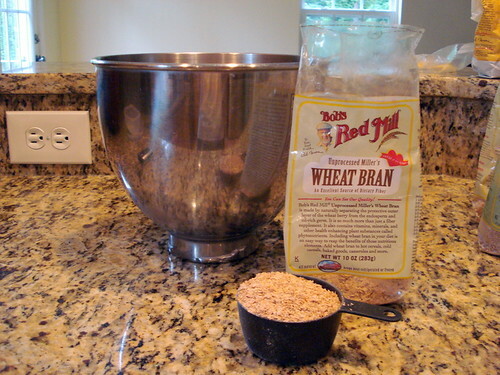 The wheat bran is cheap to buy, so I use more of it. Also, a ton of fiber never hurt anyone. We're almost done with these grains. Bear with me. Here's a cup of plain old oatmeal. 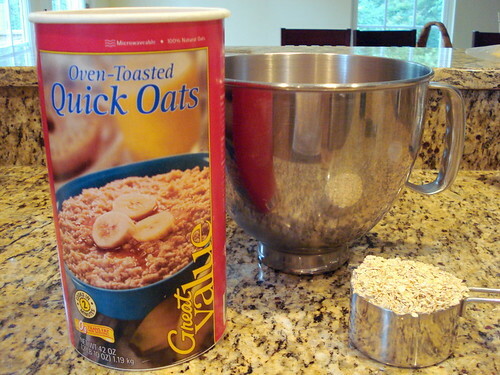 You can use quick oats or old-fashioned... whatever! I bought quick oats for Bo but he's not crazy about oatmeal, so now I have this crap sitting in my cupboard. I think I'll use it in this bread. Let's see what we've got here. Hmm - almost done with this stuff. Ah! And there you have it! Granny bread! Finally, I add a cup of whole wheat flour. 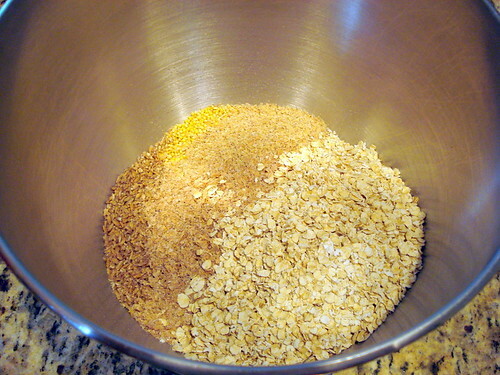 Now, I ONLY add one cup, even though we're making two loaves of bread. For one thing, there's already enough stuff in here to make it healthy. Secondly - and most important - it is vital to the success of your bread that there be lots of gluten. Gluten forms the strands that make it possible for the yeast to create lift. If there's no gluten in the bread, you could add a cup of yeast and it wouldn't do a thing. And none of these grains have any gluten, and whole wheat flour doesn't have much. That's why, from now on, we're adding plain old white flour. Heat up two cups of water in the microwave until it's very warm - about the temperature you would want your shower. NOT BOILING HOT! For my microwave, this is about twenty seconds. Then, after testing the temp with your finger - I repeat, it should not be so hot that you can't keep your finger in the water - add a tablespoon of white sugar. 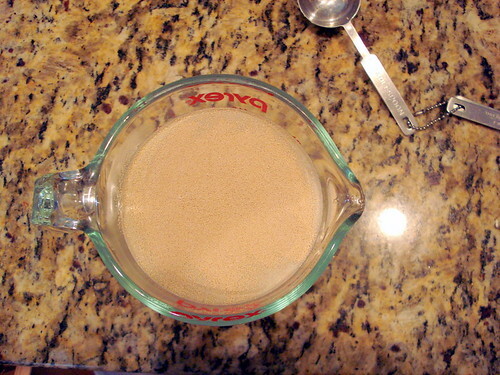 Next, add a heaping tablespoon of yeast. I think this is instant yeast - I'm not sure how "rapid rise" yeast would turn out so I don't use it. This was actually all the yeast I had left, and I wasn't sure if it would be enough. Oh, but it was. Never underestimate the power of instant yeast. 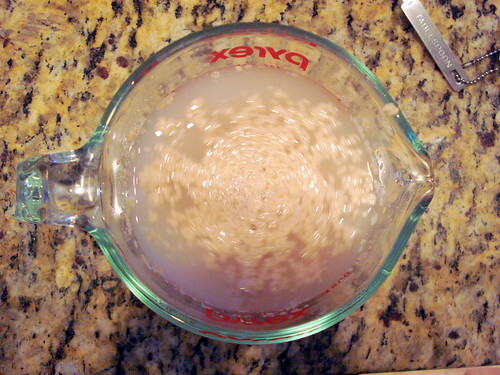 This is what the yeast looks like after you've sprinkled it on top of the water. 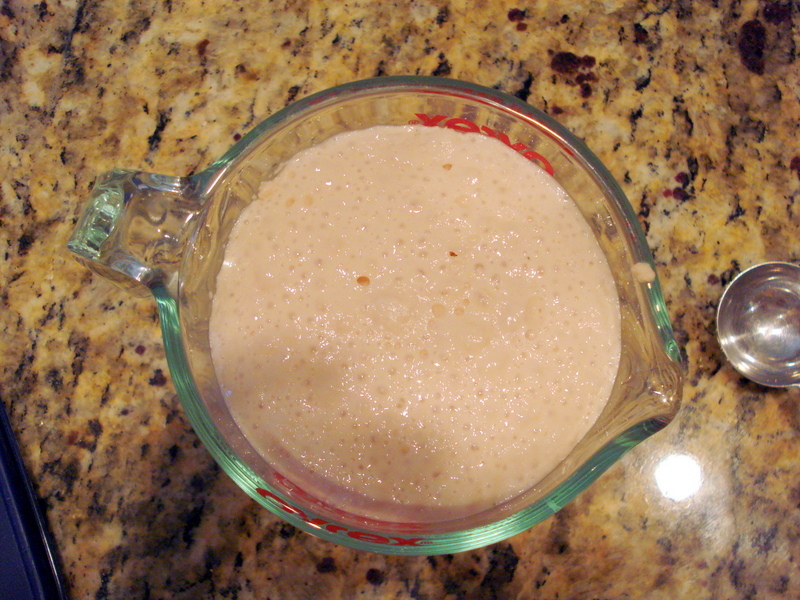 And THIS is what the yeast should look like after you let it sit for at least five minutes. Pour it on in, and keep that cup for the next step. 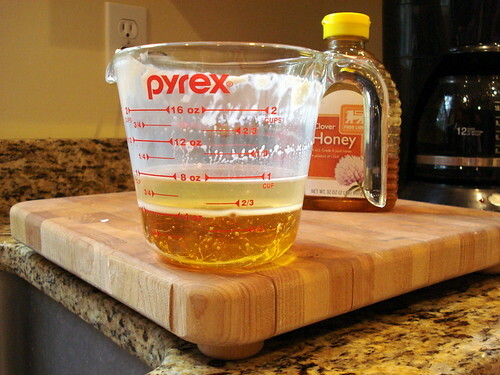 Pour in between 1/3 to 1/2 cup oil. I use canola. Next add about 1/2 cup honey. 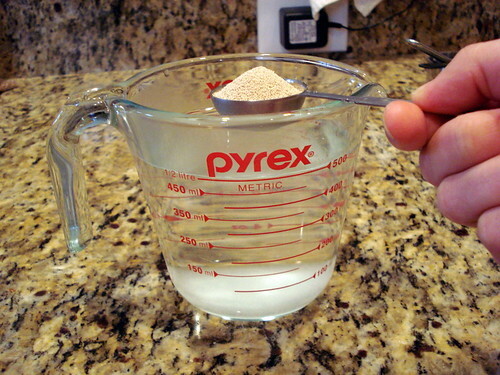 You can use brown sugar if you want, or white sugar. Or molasses. Remember, this recipe was meant to be changed. Pour it in the bowl with everything else. HEY, BY THE WAY! There's no picture, but you also need to add one cup of milk! Warm it in the microwave so it's not refrigerator-cold. Finally, ADD SALT! If you don't, your bread will not taste very good! I give it a big old handful. This might be almost two tablespoons. 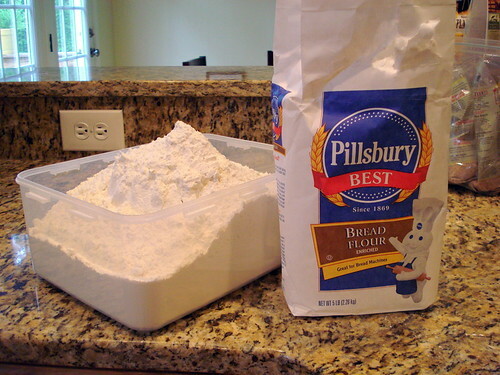 Get your white flour all ready to go. We're going to be adding it into the dough while it mixes. 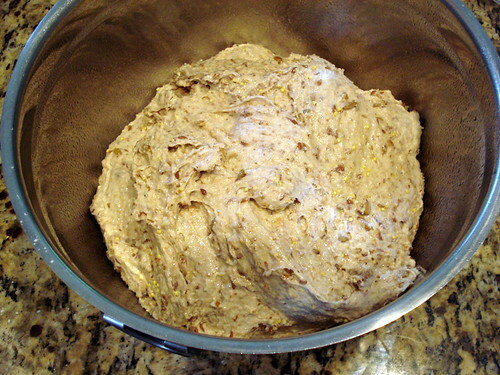 Right now, the dough should be really wet... it doesn't look like bread dough. 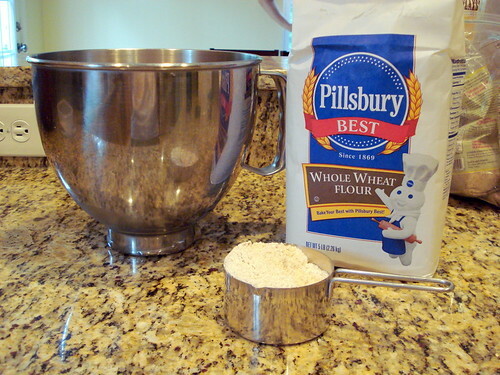 I use bread flour, which has more gluten than all-purpose. I buy this because I often make bread. But you can use all-purpose if that's all you've got. Now, to mix it up. Here, I've added about three cups of white flour and it is still too loose. It shouldn't look like batter. We're going to go ahead and add more. Here, I've added about five cups. And it's good! Now, I know this might look too loose, but it's not. You don't want to pack this bread full of flour to the point that it's so dense it won't rise. When it's a little looser than your basic loaf of white bread, it'll rise nicely and won't be hard to handle. Now, let the mixer go (mine is on speed 2) for another five minutes. Or knead by hand for 8 - 10 minutes. And here, it looks done. 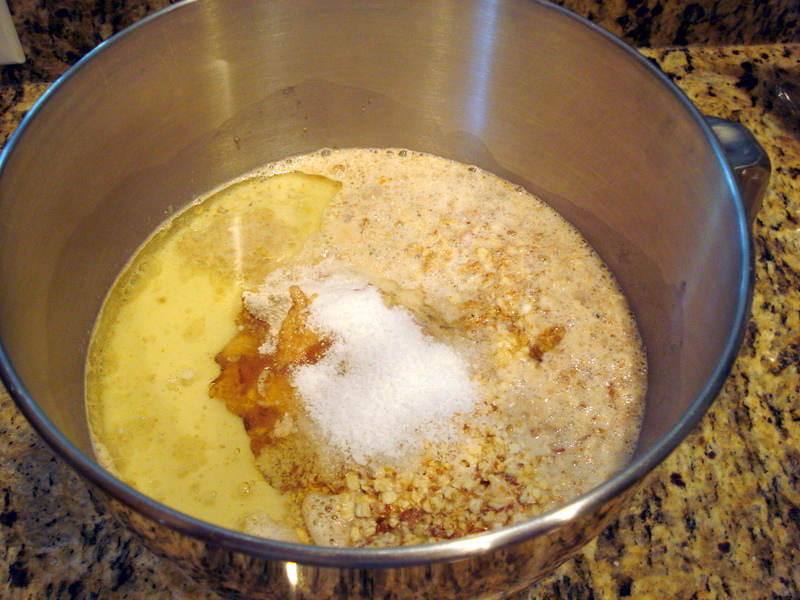 Now, grease a bowl and scoop in the dough. (I won't tell anyone if you don't wash all of your dishes right away.) Next, spray the top of the bread with cooking spray. ...and then punch it down, like this. You can do that one or twelve times. Usually, I am not in the mood to deal with it after the first couple of times, so I just keep punching it down until I'm ready. 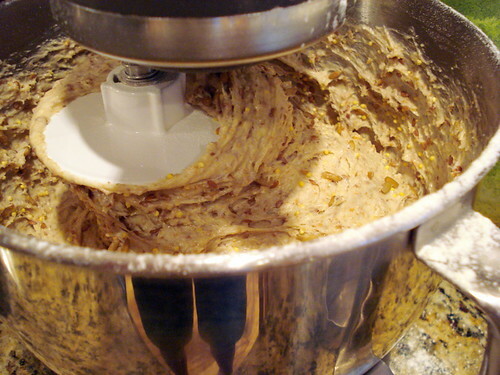 Scoop out the dough, cut it in half, and fold each piece a couple of times. 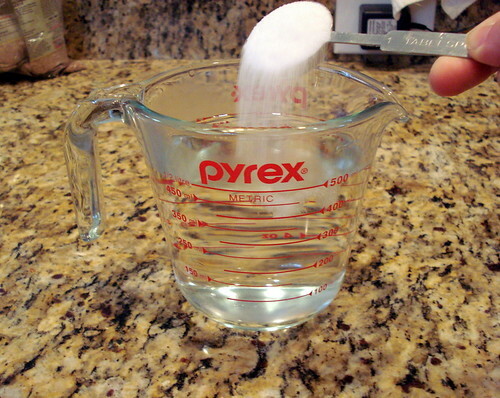 Then pinch it all together at the bottom and use your palms to make it more oblong that round. Voila! A formed loaf. 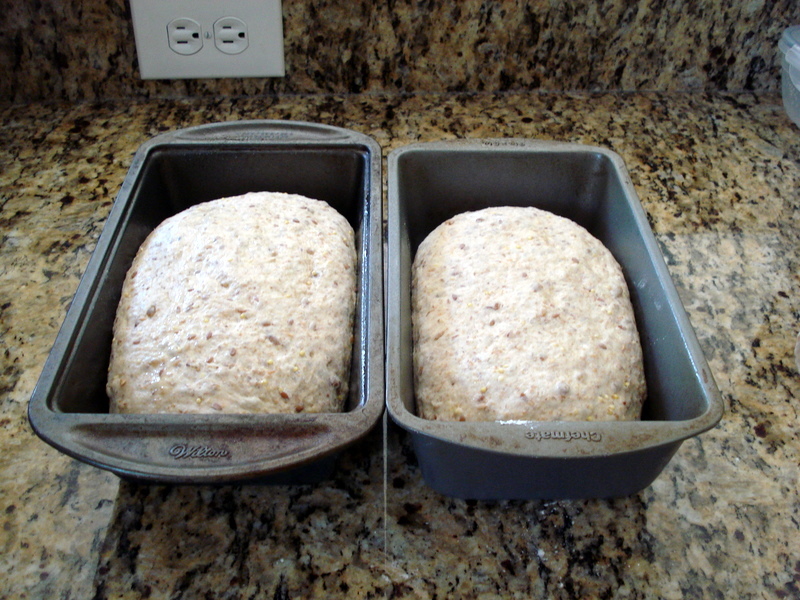 Lightly spray two loaf pans and put in your bread dough. 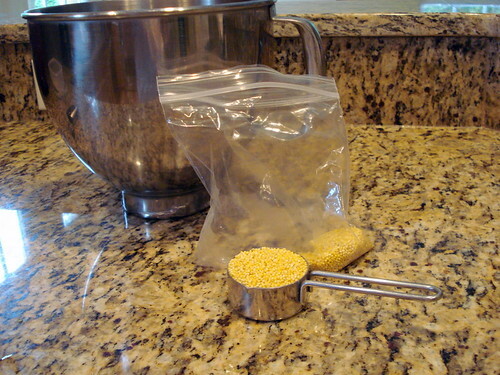 I didn't take a picture of this, but after that, spray them lightly with more cooking spray and cover with plastic wrap. You don't want it to dry out right now. Bake at 350 F for 30 minutes! These look a little deflated on top, because I let the dough rise a little tiny bit too high in the pans. But when we cut into it, it looked just fine. Soft, healthy, and delicious. This bread freezes great. Once it's cooled, you can wrap a loaf in plastic wrap and throw it in the freezer. Or, you could slice it first. OR, you could slice it frozen- it's easy to do. So many choices! I can honestly tell you that this bread is WAY better than store-bought. Yeah, it's more work. But in my opinion, it's definitely worth it. Plus... it's kind of fun to make bread. Just you wait and see. 1. Throw the first 9 ingredients into your mixing bowl. 2. Heat the two cups water until very warm but NOT hot. Mix in sugar and yeast. Let stand until foamy. 3. 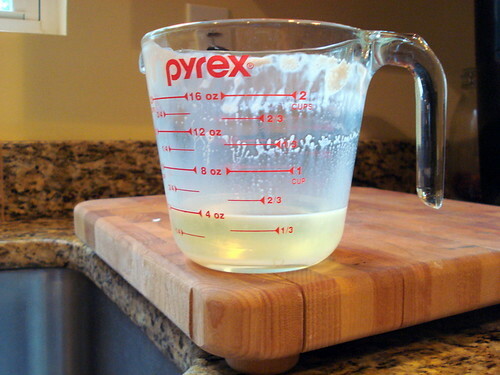 Measure next four ingredients, oil through salt, and add them to the bowl. 5. 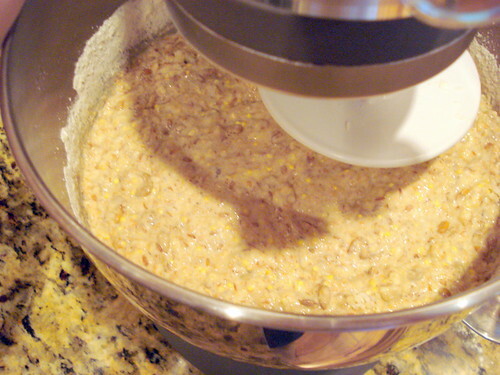 Blend in up to five cups of flour (I usually use four) until the dough is NOT batter but still clings to the sides of the bowl while it’s mixing. You should be able to reach in and pull out a chunk. It shouldn’t slide through your fingers. 6. 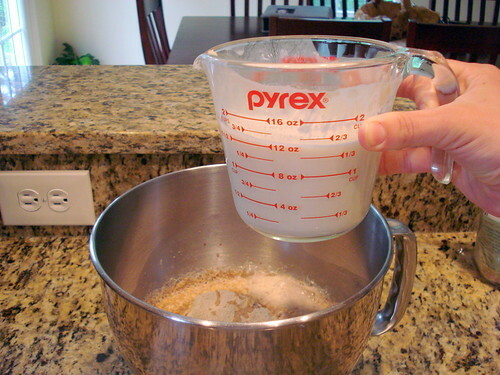 Mix on speed 2 of your mixer for 5 minutes more. 7. Scrape into an oiled bowl. 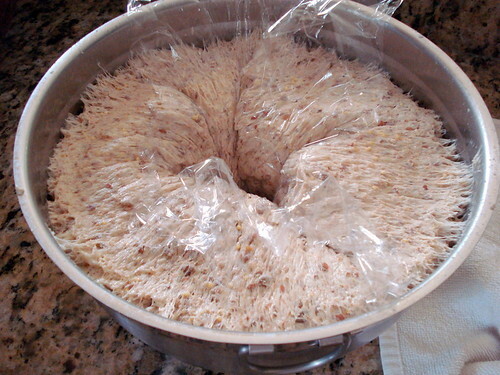 Oil top of bread and cover with plastic wrap. 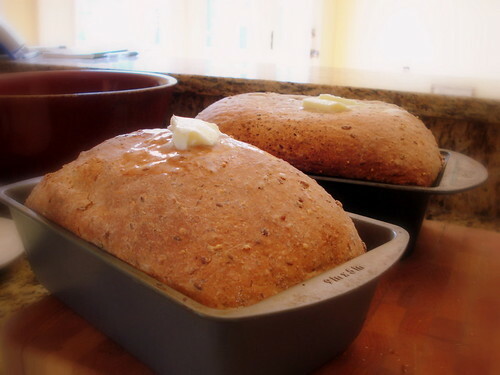 Let sit until bread is risen (45 minutes to an hour). 8. 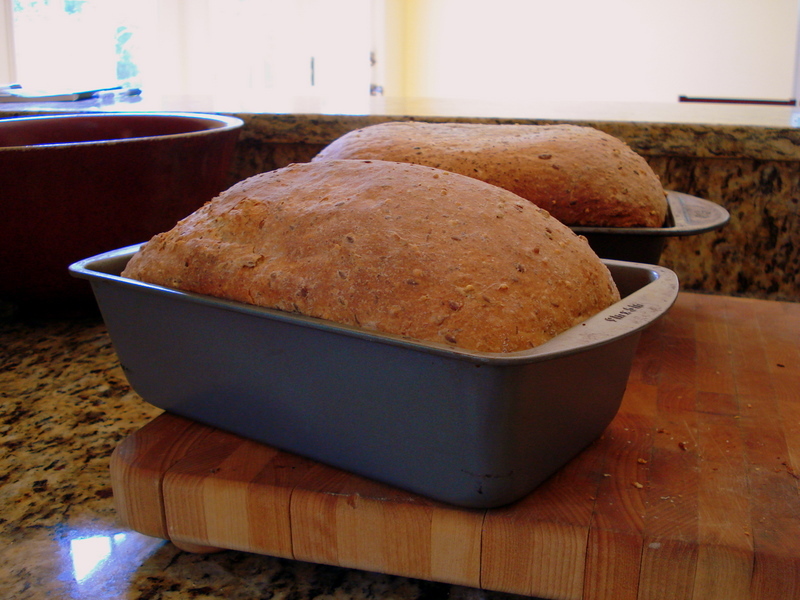 Oil two 9x5 loaf pans. 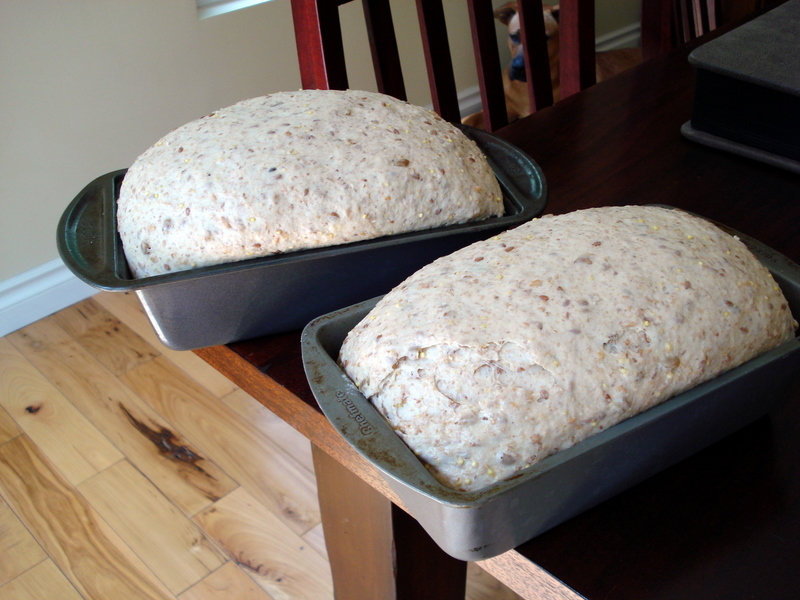 Scrape out the dough and form into two loaves. Let loaves rise in pans until about one inch over the rims. 9. Bake at 350 F for 35 minutes. 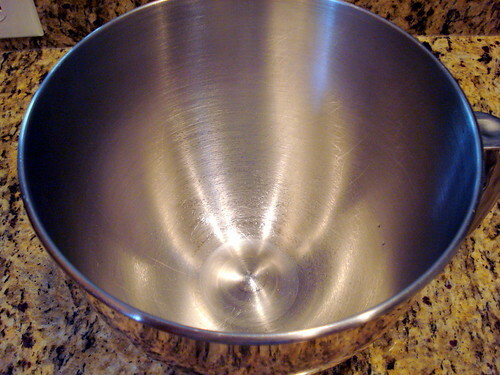 If tops are browning too much, cover loosely with foil. 10. 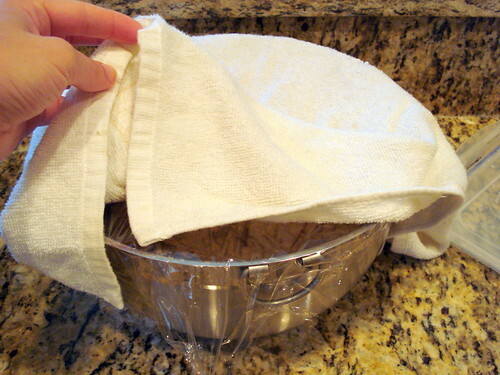 Remove loaves from pans and cool on a rack. Butter tops, if desired. Looks really good. 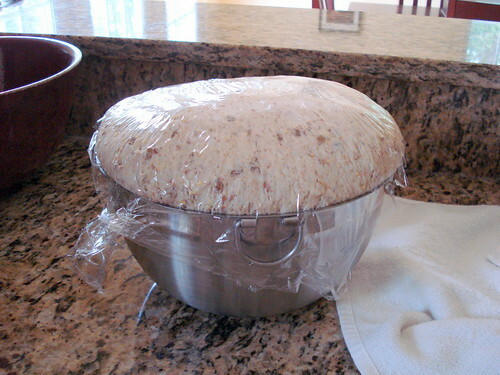 I honestly have never made bread from scratch but this looks easy enough. I have already made your pizza dough recipe, and I trust your cooking and baking through and through...the other day, my husband said "hey Honey have you seen Maegan's amazing recipe? You really, REALLY should make it.." so, this weekend, I think I will make it...it will be my apres-work therapy session....I love you, and will think of you while baking and eating it, and using my new kitchenaid and beautiful cutting board which is now a staple in our kitchen! And Elisabeth, I even steered you wrong... sorry I forgot the milk! How did it turn out?